1.13 – Should I Stay or Should I Go Now? Washington has an important decision to make as the Election of 1792 looms. 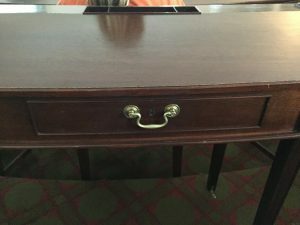 Should he accede to the wishes of many and stand for reelection or should he take his weary bones back to Mount Vernon for the remainder of his days? 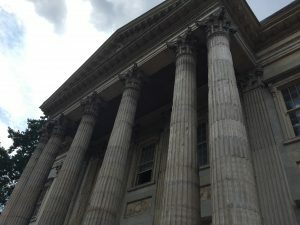 The growing factional agitations that were exacerbated by Hamilton’s submitting his Report on Manufactures as well as a financial panic in 1792 do little to make the situation better. Meanwhile, Hamilton’s affair with Maria Reynolds gets ever more complicated. And did the Attorney General just say something about a potential civil war? Washington’s action-packed first term hits some bumpy roads in this episode. Source information can be found at http://presidencies.blubrry.com. Greetings, folks! 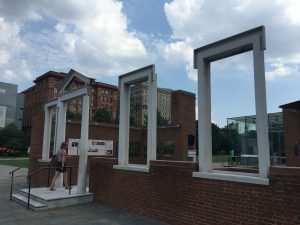 I’m writing to you this morning from Philadelphia, PA where I’ll be attending the annual SHEAR (Society for Historians of the Early American Republic) conference to hear about the latest scholarship in the field that I can then incorporate into future podcast episodes. 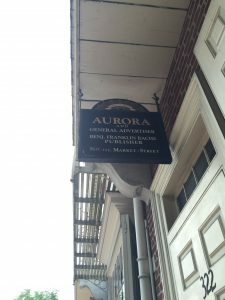 In the meantime, I wanted to share some of the sites that I’ve seen thus far that I thought might be of interest to all of you. 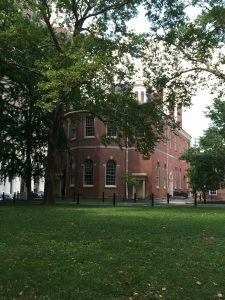 We’ll start with Independence Hall, which is of course the most recognized landmark in Philadelphia. 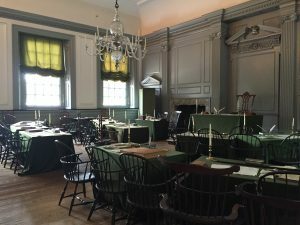 This room was the location not just for the signing of the Declaration of Independence but also the Constitutional Convention. 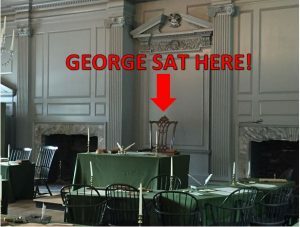 As we’ve discussed, George Washington presided over the Constitutional Convention in 1787 in this very room. 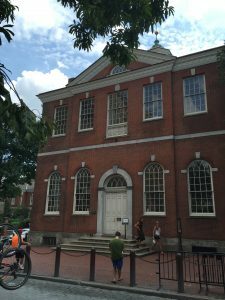 Independence Hall was also a significant landmark for one of Washington’s successors. 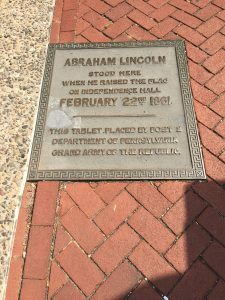 As the nation was facing the uncertainty of disunion, Abraham Lincoln visited the Hall on his way to assume the presidency in 1861. 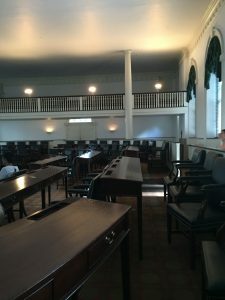 His body would then be returned in 1865 and set up for viewing in the same chamber in which the Declaration was signed and the Constitution was crafted on its way back to Springfield. 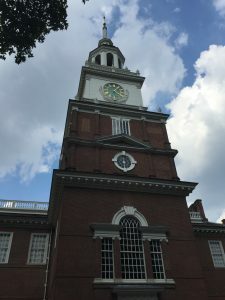 When facing Independence Hall, just to the left of it sits Congress Hall, which is where the US Congress under the Constitution met from the time the capital moved to Philadelphia in 1790 until it moved on to Washington, DC in 1800. When we discuss deliberations in the House of Representatives during this time, picture this room as this is where it happened. 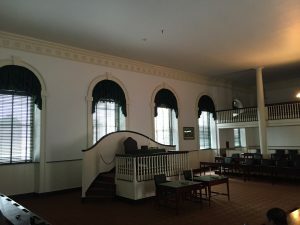 This was also the room in which John Adams was inaugurated as the second President of the United States, marking what was a rarity at the time but what would prove to be the first of many peaceful transitions of power in American history. 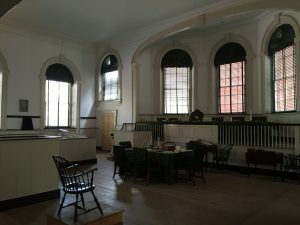 This is the Old City Hall which, as I learned when I started researching for my trip, was the meeting place of the Supreme Court from 1791 until the capital moved in 1800. This is the actual chamber in which they met and deliberated on those early cases. The big chair in the center was John Jay’s for a bit. 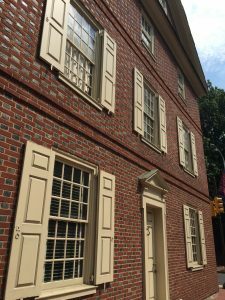 A block off from Independence Hall is the President’s House. 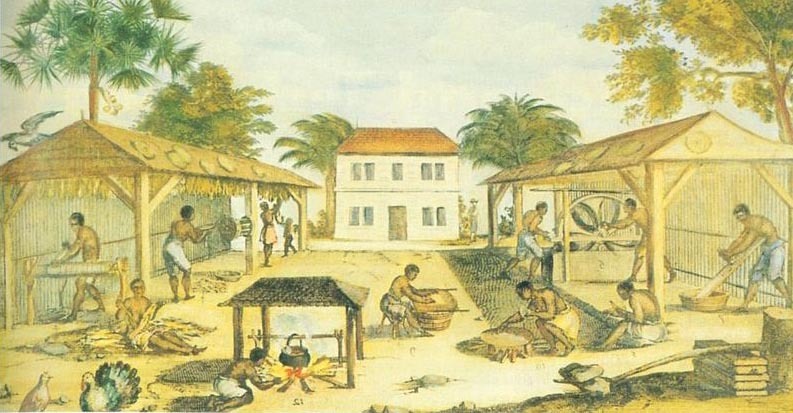 The actual house was not preserved, but excavations of the site have been done, and a facade erected to help visitors to understand the dimensions of the house as well as to interpret what life was like for all of those under its roof, including the enslaved people he brought from Mount Vernon such as Oney Judge and Hercules. Formal levees, dinners, Cabinet deliberations, all of those would have occurred under this roof. 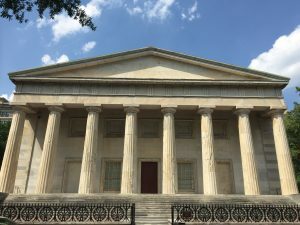 The Second Bank of the United States, which would cause even more political rancor and factionalism. 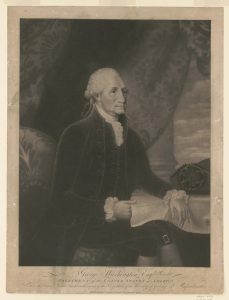 Benjamin Franklin Bache, the grandson of Benjamin Franklin who will cause President Adams a good bit of grief, but that’s on down the line for us. For now, I’ll leave you and get back to exploring. Thanks so much for joining me on this brief photo tour, and stay tuned for more, including our next episode which will be launching this Sunday! Brodsky, Alyn. Benjamin Rush: Patriot and Physician. New York: St Martin’s Press, 2004. Dabney, Virginius. Virginia the New Dominion. Garden City, NY: Doubleday & Co Inc, 1971. Davis, Herald E. The Fledgling Province: Social and Cultural Life in Colonial Georgia, 1733-1776. Chapel Hill, NC: University of North Carolina Press, 1976. Finnie, Gordon E. “The Antislavery Movement in the Upper South Before 1840.” The Journal of Southern History. 35:3 [Aug 1969] 319-342. Isaac, Rhys. 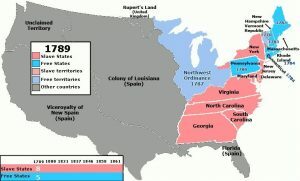 The Transformation of Virginia 1740-1790. New York and London: W W Norton & Co, 1982. Jordan, Winthrop D. “Enslavement of Negroes in America to 1700.” Colonial America: Essays in Politics and Social Development. Stanley N Katz, John M Murrin, and Douglas Greenberg, eds. New York: McGraw-Hill Inc, 1993 . p. 288-329. Kay, Marvin L Michael; and Lorin Lee Cary. 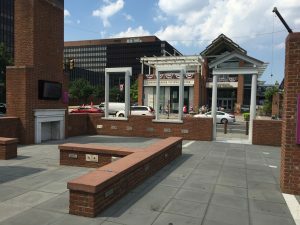 Slavery in North Carolina, 1748-1775. Chapel Hill and London: University of North Carolina Press, 1995. Levy, Andrew. The First Emancipator: Slavery, Religion, and the Quiet Revolution of Robert Carter. New York: Random House, 2005. Morgan, Philip D. “’To Get Quit of Negroes’: George Washington and Slavery.” Journal of American Studies. 39:3  403-429. Nash, Gary B. Race and Revolution. Lanham, MD: Rowman & Littlefield, 1990. 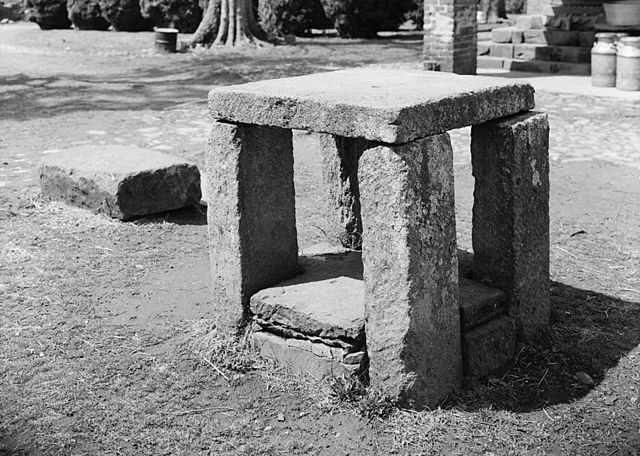 Weir, Robert M. Colonial South Carolina: A History. Columbia, SC: University of South Carolina Press, 1997 .